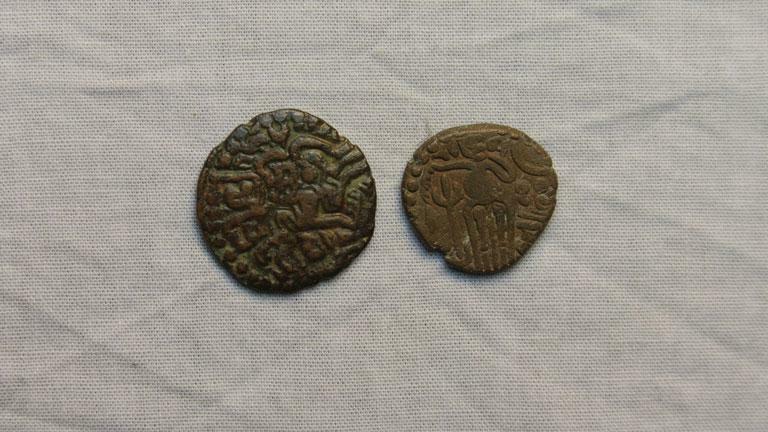 The coin was used in the Chola Dynasty (9th- 13th C CE). This particular coin was introduced by Raja Raja Chola (985 CE- 1014 CE). Obverse: A standing figure of the King with head facing towards the right is visible. The left hand holds flower and the right hand is extended outwards. A lamp is seen on the left and pellets are seen on the right. Reverse: A seated figure of the King with left arm raised and the right arm resting on the knee is visible. In the right field Nagari legend Sri/Raja Raja can be seen.